Acme Range-Rebound bars are a hybrid which combines the attributes of range and reversal bars into a single, simple, time-agnostic bar type. 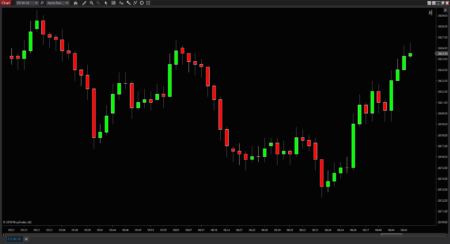 While the can be used with any kind of chart, Range-Rebound are particularly useful in tick analysis/order flow charts such as the Volume Impression. How do they work? 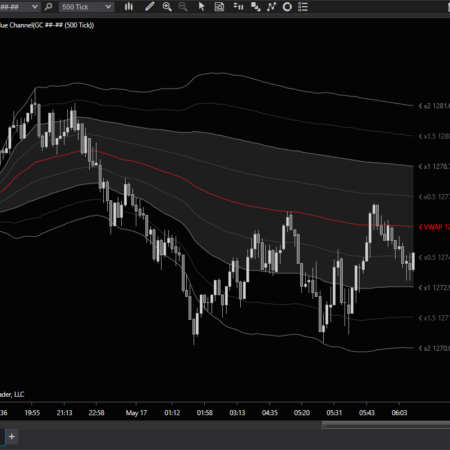 The Range-Rebound bars have 2 parameters: the minimum range in ticks; and the minimum rebound (or reversal) in ticks needed to close the current bar and create a new one. 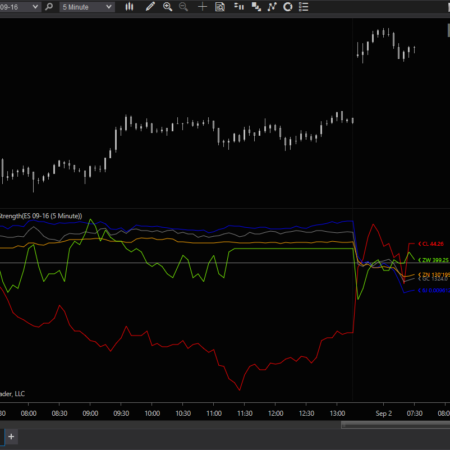 For example, say you’re charting ES and using a Range of 6 and a Rebound of 4. 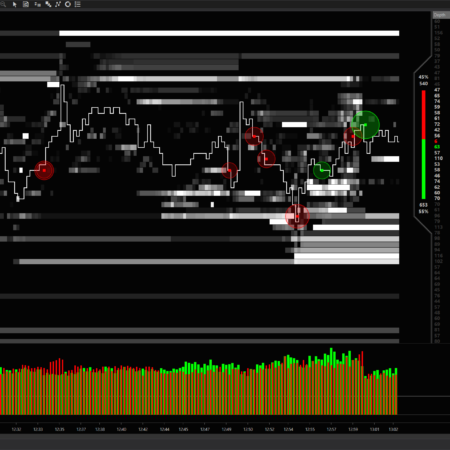 Using these parameters, once a new bar is created price must move in one direction or the other at least 6 ticks from the open price. 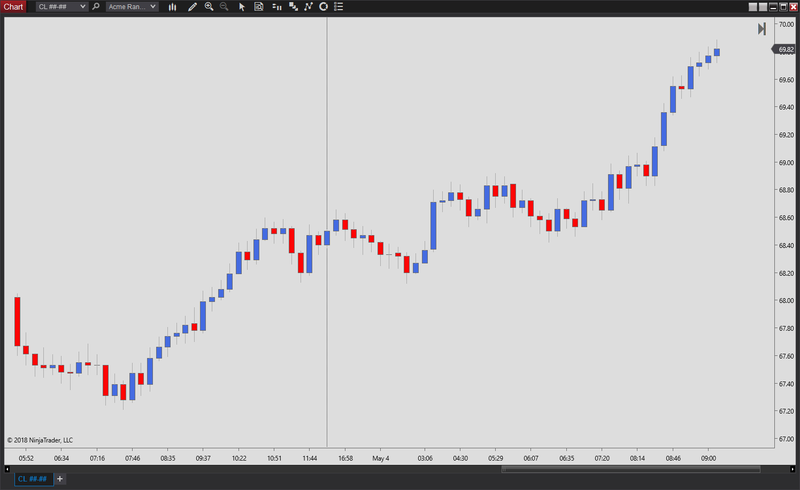 Once price moves at least 6 ticks away, price must now move at least 4 ticks in the opposite direction in order to close the bar and start a new one. Direction: when price drives up or down, large and visually distinct bars are created rapidly. As long as price keeps driving in the same direction (within the set parameters), the same bar will expand in the direction of price movement. 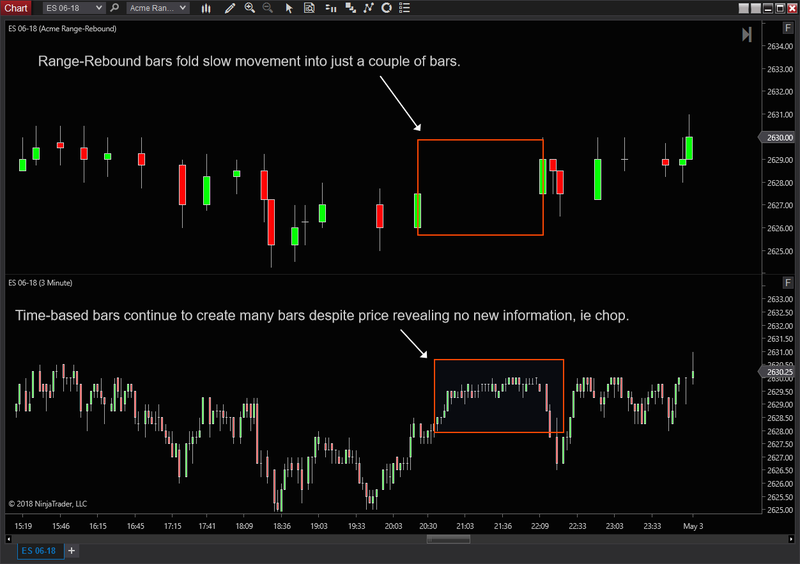 Pace: when price moves slowly, few bars are created regardless of time elapsed. 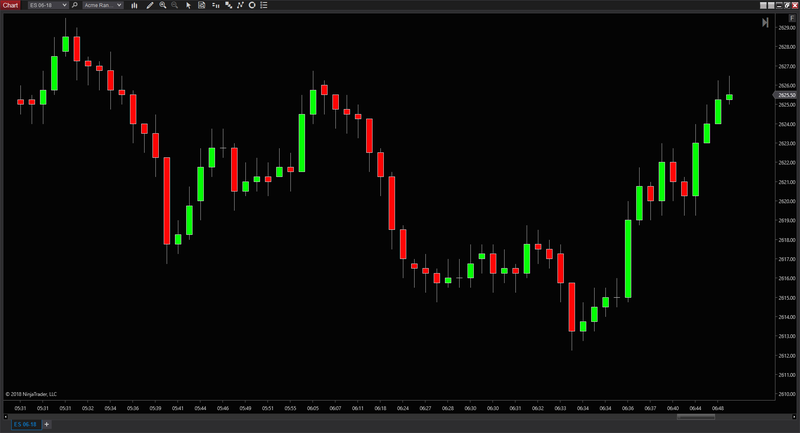 When price moves quickly, Range-Rebound bars expand rapidly and stand out visually. Swing highs and lows: the rebound/reversal aspect of this bar mean even slow turning points appear sharper and more defined. 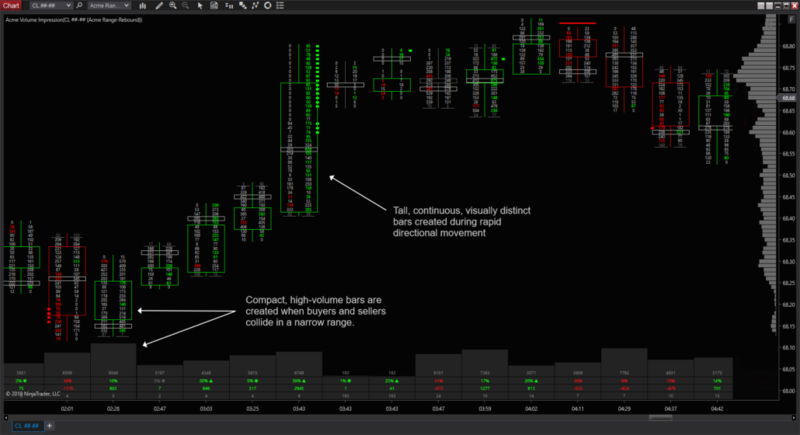 Horizontal space efficiency: because slow, choppy price action is naturally folded into fewer bars less horizontal space is used to display each session. 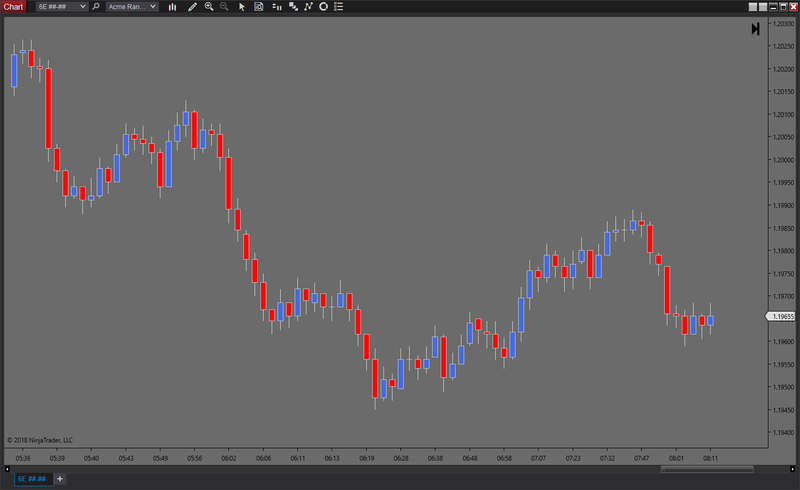 Less space and less scrolling mean faster and cleaner intraday charts. 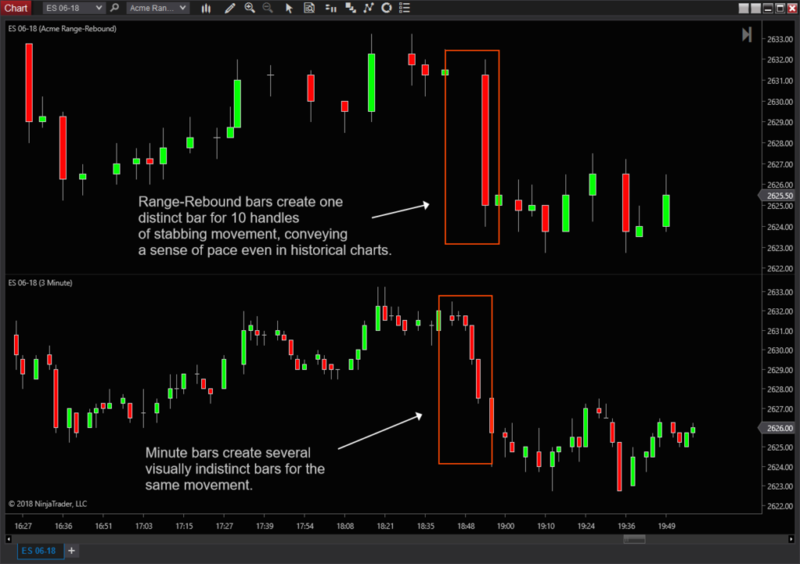 NOTE: in some of the examples below the Range-Rebound bars are spaced irregularly so they correspond to the same range of prices in the Minute bars on the lower series.